What’s Stopping You? Opens TODAY! The BIG day is finally here! The doors to my academy, What’s Stopping You? are now open! This is our final launch this year and will not be opening again until sometime in 2017! Let’s get ready to start your business today! Your time is NOW! If you have thought of starting your practice or business, your opportunity for the BIGGEST lifestyle changes it by erasing those fears and living in your purpose! More importantly, you will be living your purpose and help clients/lifers on a daily basis! Think about it…have you dreamed about a practice one day? Was it while you were in school or at your current job wanting to reach clients on another level? And as you started to think about starting your practice all those negative voices of the mind just ran over all your dreams! I truly believe there should be MORE dietitians in private practice and yet we sometimes get bogged down with all the details and never build our dream practice. I want to create better access to dietitians by giving you the skills to be successful and happy in your practice! The ones I want to bring into my community, my tribe, just like YOU! The window of opportunity is still wide open for you although it won’t remain that way much longer. Join me in my online academy, What’s Stopping You before we close our doors for the final time this year. It’s time to stop allowing fear to hold you back. It’s time to stop being an observer, watching everyone else’s practices from the side lines. 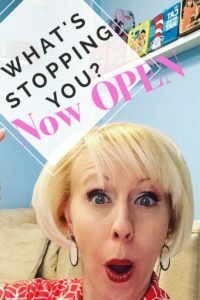 It’s finally time for you to take action, start creating your own and take your business to the next level! Click the link below for a detailed breakdown of exactly what you will learn in my academy, an introduction video taking you through the course, and once you register check you inbox for the special Bonuses I have for this final launch in 2016 and to sign-up before all the spots are taken and we close the doors once again! This is your time! Why not you? Why the heck not you! Let’s do this together! See you inside the academy!